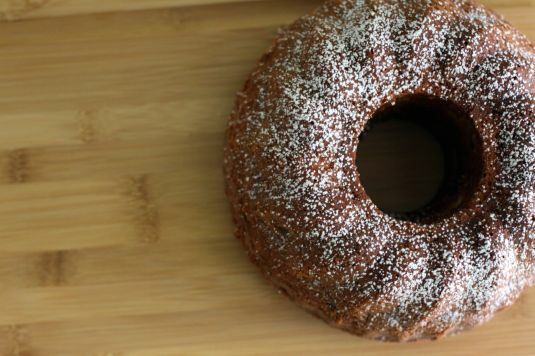 It’s hard to say where this kugelhopf originated from. While other kugelhopfs start from sweet, yeast-risen dough, I grew up eating a rich cake-like version my grandmother made. 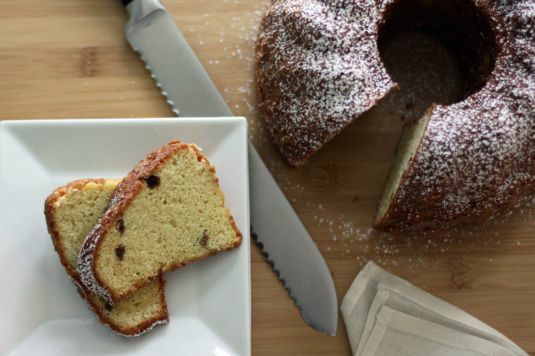 With its distinct rich taste and buttery texture, this moist cake is the perfect complement to your morning coffee and manages to hold its own after the main course with a cup of coffee. The reason it’s hard to say where exactly my grandma’s kugelhopf came from is that her history is a bit like a rubber ball, bouncing off the walls and never really landing in the same place twice. She was born in Neu Banovci in what is now Serbia, then Yugoslavia. Her father died when she was young, and she was sent along with one of her sisters to live in a Lutheran orphanage in Torža (Savino Selo), where she lived and then worked at the age of 16. During World War II she was sent to several DP camps, the first in Salzburg and then near Vienna. She moved back to Salzburg to live with a family as their nanny, and then she came to the U.S. with her mom and 3 sisters after the war. Somewhere along the line, this recipe became a part of her life. It made the trek to St. Paul, and it was served up on a plate to win my grandpa’s heart, to fill my dad’s belly and then mine. And it all starts with this pan. 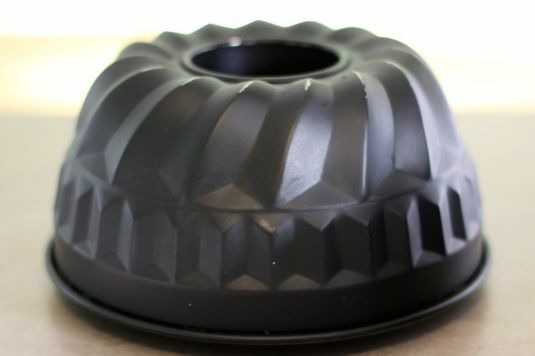 Similar to a Bundt pan, a kugelhopf pan is a bit more intricate and comes in a variety of sizes and patterns. Grease and flour the pan. Don’t be stingy, and make sure you fill all the cracks and crevices. 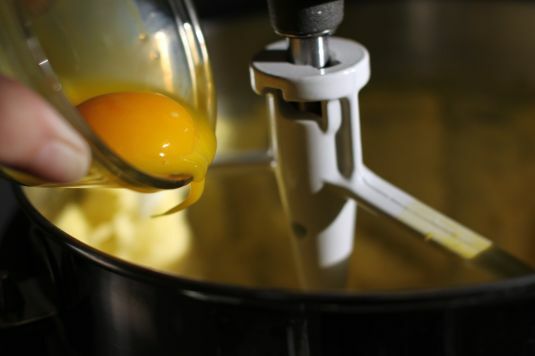 Then separate six eggs in whichever method you prefer. 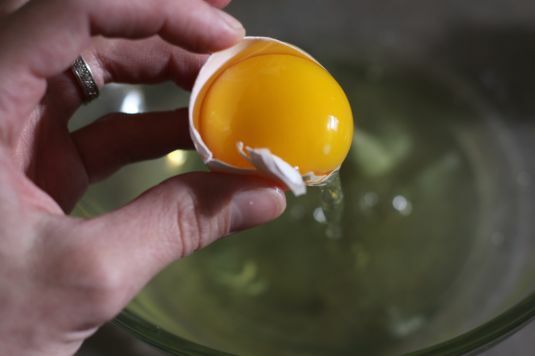 I like to crack them in half and then juggle the yolk for a while between the two shell halves, letting the whites fall into a bowl. Set the whites aside. We’ll visit them again later. 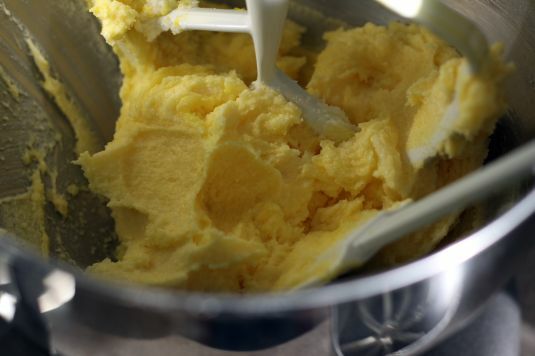 In a mixer, cream the softened butter and a bit of salt together. Then add the sugar and beat until creamy. And you’ll have this lovely, lemony yellow. 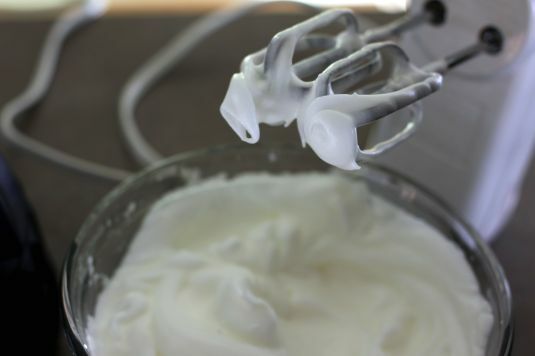 In a small cup, like this one, mix together a bit (3 tablespoons is all) of cream and the vanilla. 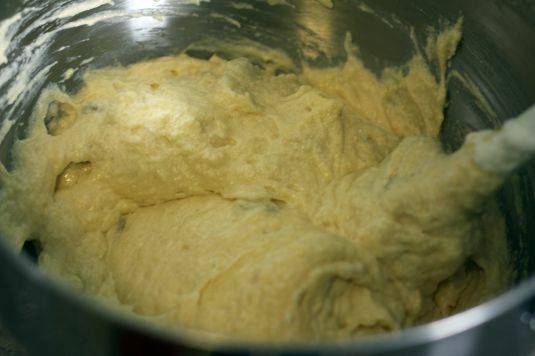 Then sift together the baking powder and the flour and have it ready to go. 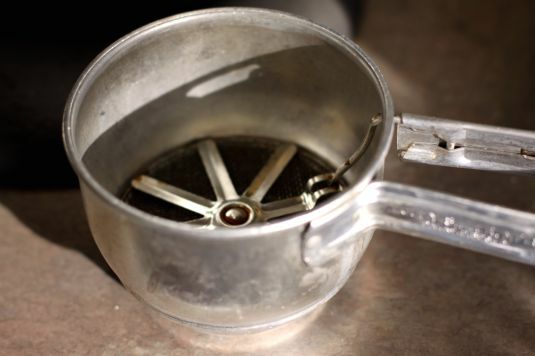 This is my grandma’s (mom’s side) sifter. It’s kind of rusty. I like it that way. 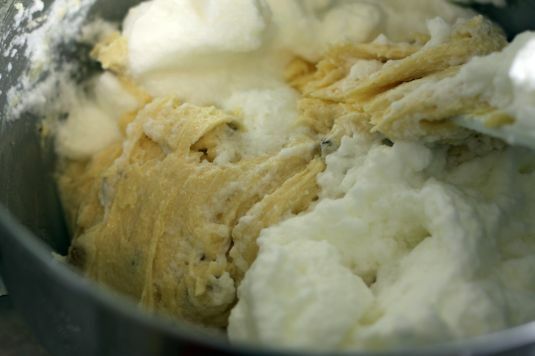 And then alternate adding scoops of flour and tablespoons of cream and vanilla. You should do it about 3 times, until both are gone. Mix just until combined. And then you’ll have this, but we aren’t done yet. 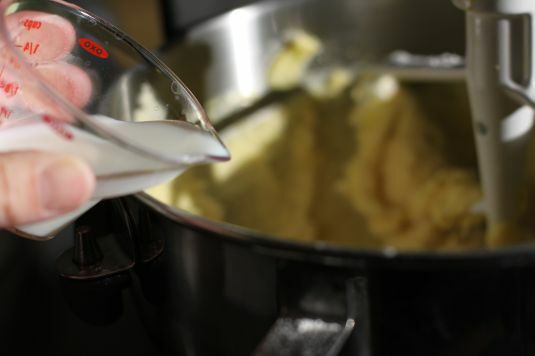 Find the whites and beat them with a pinch of cream of tartar until stiff peaks form. Stiff peaks don’t look particularly droopy. They have a nice, solid color and an appearance similar to Cool Whip, except they’re not, so don’t try to eat them. I can’t tell you how many times my kids have tried. Often. 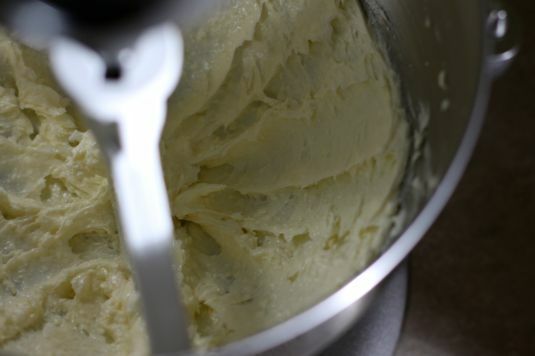 Add about 3/4 cup egg whites to the batter and mix in gently. Then add the rest of the whites and start to fold slowly into the batter. 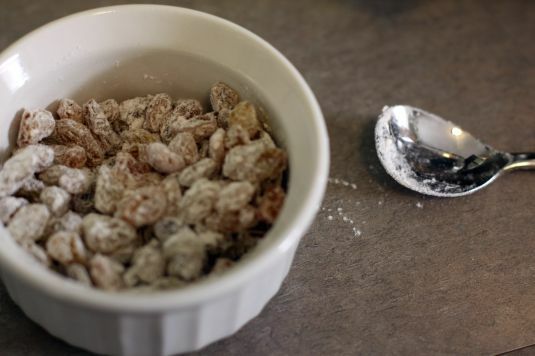 Just before you’re completely folded, when there are still several streaks of white, add 1/2 cup of golden raisins, tossed in flour. 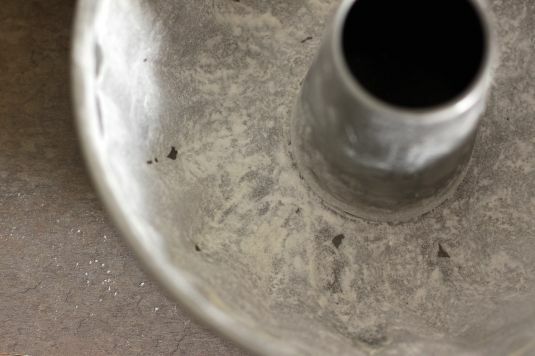 The flour will help them from sinking directly to the bottom of the kugelhopf pan, which leads to stickage, which leads to a kugelhopf that does not want to come out of the pan. So, dust liberally. And then finish folding it together. Don’t over mix here. A few white streaks are okay. Add the batter to the pan. It will not fill the pan, but it will rise while it’s baking. Place it in a 325º F oven for 70 minutes. Do not peek. Do not shake the oven. Do not poke and prod the cake. Leave it in there, alone, for the full 70 minutes. Then remove from the oven, let it cool for 6-7 minutes and invert it onto a plate, removing the pan. When it’s a bit cooler, sift powdered sugar all over the top. Be as liberal as you’d like. There’s something about making this that makes me wish I’d had the chance to do more than just observe in my grandma’s kitchen. I was far too young to understand the importance of asking about more than the how-to method and ask for the story behind the food as I watched her cook, but I wish I would have. And the story I will tell my children before they are old enough to think to ask is the one of my grandma, bringing her recipes here to cook for my grandpa, bringing her recipe here to feed my grandpa and passing it down for them. Be sure to check out the other WanderFood Wednesday posts for more inspiration and Wanderlust finds. Click here for the printable recipe card! Never miss a recipe! Have them delivered right to your RSS feed or to your inbox as an email! 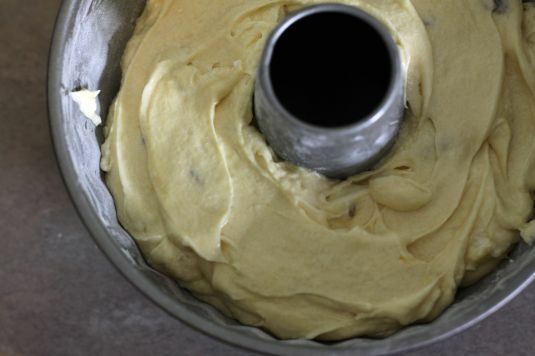 And how bad is it that I do not own a bundt pan? Guess I’ll just have to drop by for tea this week. You free tomorrow? You can come right over. Wouldn’t that be fun?! WOW – thanks so much for this! I was just thinking yesterday that I need to get back to cooking my grandma’s recipes. But really, anyone’s grandma’s recipes would count, right? Kugelhopf is perfect! THANK YOU! Thanks for this delicious looking recipe. I didn’t know anyone else even knew about Kugelhopf! 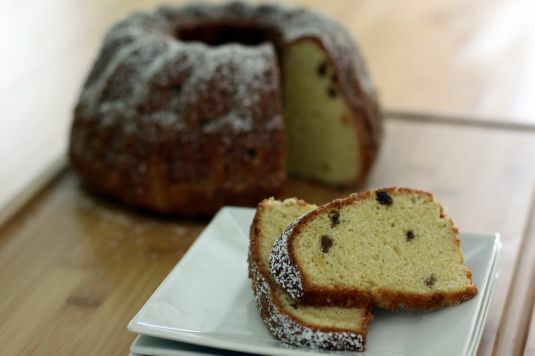 I grew up with Kugelhopf almost as a staple in my German origin family. 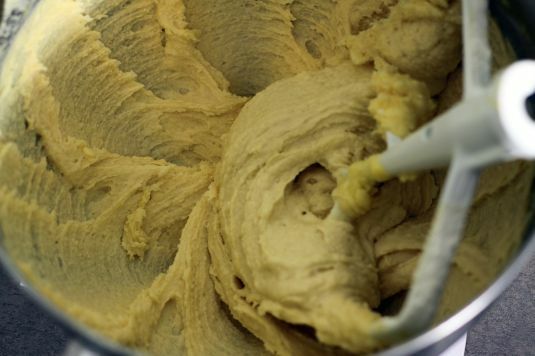 But my mom would always buy it from a special Austrian bakery in our neighbourhood; it never occured to me to look for a recipe, as it was always a ‘bakery’ item. Now, I have the recipe and can make my own, using this recipe, and will dedicate it to my late mother, whose rescue, dependable go-to was always Kugelhopf. This name conjures up so many good foodie memories. I’ll let you know how it turens out! Your kugelhopf looks just delicious !! How wonderful to have such rich family history in the recipe as well. Thank you for sharing. I’m a sucker for a good coffee cake and this looks amazing! .-= Wanderluster´s last blog ..Photo of the Day: Sunrise in Hanoi =-. Just baked it yesterday. It’s a winner, my BIL thought it was from a bakery, and my sister said it was better than the one from the bakery! Now I have some of my childhood back. Many thanks. Terrie, I’m so glad! Thanks for coming back to share. I must has over folded those egg white! Oh, I’m sorry to hear that! It can definitely happen if you overwork the egg whites and lose the air bubbles. I made this last night. Very delicious. Next time, I will cut back on the sugar a bit…maybe to just one cup. Very moist and fluffy. Thanks.